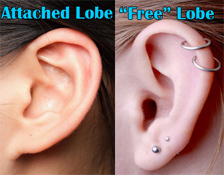 Hollow flesh tunnels are a classic option for stretched ear piercings and they come in a huge choice of designs. 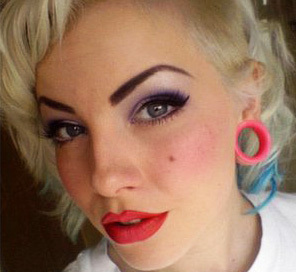 Hollow flesh tunnels are cylinder-shaped pieces of jewellery that are lighter than solid flesh plugs and often place less stress on the piercing as a result. Another advantage of hollow flesh plugs is that they are compact and do not move around in the piercing, as large gauge BCRs and bars can. 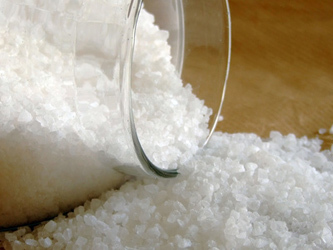 Surgical steel is one of the most popular materials for body jewellery because it is biocompatible, strong and cheap. 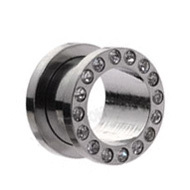 Surgical steel is very comfortable to wear and it can be made into a wide range of hollow flesh tunnels, from plain tubes to glamorous designs like these jewelled steel flesh tunnels. It is important to make sure that your tunnels are made from high quality surgical steel, as inferior steel jewellery can irritate your ears. Here are BJS all our steel jewellery is superior 316L surgical steel but if you are shopping elsewhere always ask before you buy. 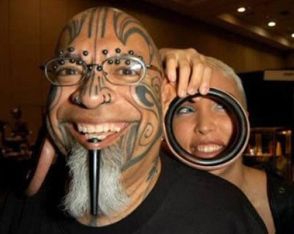 This entry was posted in Stretched Piercings, Stretching Jewellery and tagged Ear Stretch, Ear Stretching Jewellery, Flesh Tunnel, Flesh Tunnels, Stretched Ears, Stretching Jewellery on November 26, 2010 by Piercing Guru. 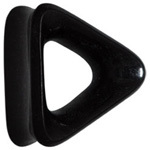 Ear stretchers are used for enlarging your earÂ piercings to reach large gauge sizes. Ear stretchers are usually used to stretch your ear piercing one size at a time, so they are generally available in a vast range of different sizes ranging from 1.6mm to 30mm. 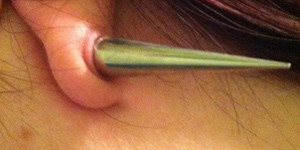 When you use an ear stretcher, you may wish to leave the stretcher in your stretched ear piercing to wear as jewellery, or you may wish to use the ear stretcher as a guide for your new large gauge jewellery such as a flesh plug or flesh tunnel. Ear stretchers come in many different styles, shapes and colours to choose from; there is something for all tastes and requirements. 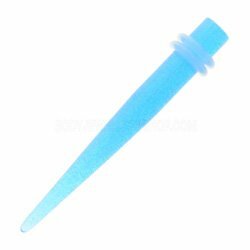 Our extravagant range of jewellery materials include these PMMA acrylic ear stretchers, Plastic ear stretcher claws and spirals, Wooden ear stretchers, UV Ultra Violet ear stretchers, Glow in the Dark ear stretchers, Surgical Steel ear stretchers and many more. This bright and funky range of PMMA acrylic ear stretchers includes the wild patterns and colours that will really brighten up your look, so stretching your ear piercing will be a fun and snazzy process from start to finish! 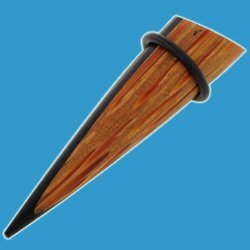 Check out the checker ear stretchers, stripe ear stretchers, Neon ear stretchers, Rainbow ear stretchers and even plain black stretchers or white ear stretchers for that slick, classic look. Natural and organic ear stretchers have the unique craft of mother nature that cannot be replicated by any other material, with fabulous natural grains, markings and hues, you can choose from our beautifully smoothed and polished wooden ear stretchers and buffalo ear stretchers including spirals, twists, claws and crescents. Surgical steel ear stretchers include a great range of stretcher spirals and crescents, as well as earÂ stretcher kits to get you started out on your ear stretching journey. 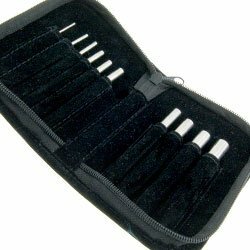 Surgical steel is very popular for ear stretching, with a fantastic value on stretching tools and great range of different types of ear stretchers to choose from, there are tools for all your earÂ stretching needs. This entry was posted in Acrylic Body Jewellery, Buffalo Body Jewellery, Glass Body Jewellery, Glow Body Jewellery and tagged Ear Stretch, Ear Stretcher, Ear Stretchers, Ear Stretching, Stretched Ears, Stretched Piercing, Stretching Piercings on February 12, 2010 by Piercing Guru.